A variety of gyms which hang to offer your birds plenty of exercise. The swing root photographed is the swing root you will receive. Due to our strict biosecurity protocols, Canopy nets are not returnable. CLICK PICTURE FOR CLOSE-UP VIEW. 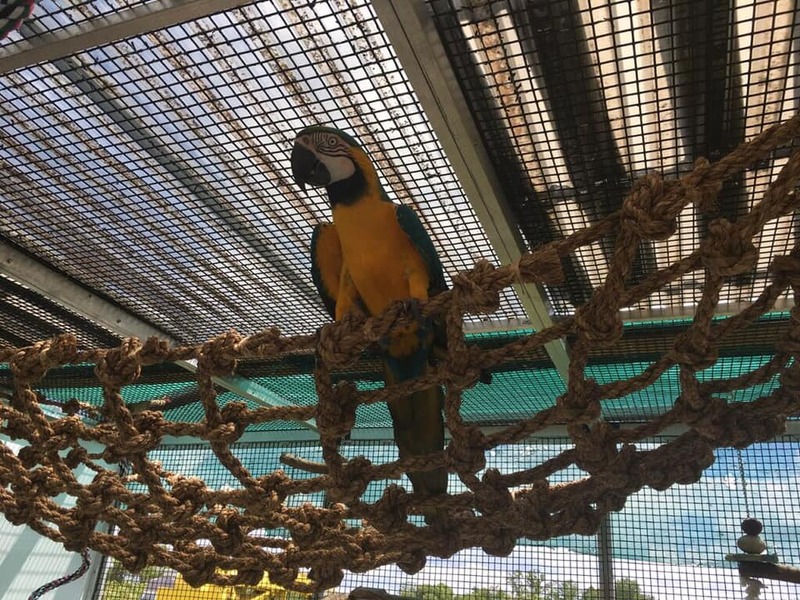 Photo courtesy of Topaz, a Blue & Gold Macaw, and his mom, Melissa. Climbing the chain and rope toy provides hours of entertainment. Complete with Chew toys, this gym is recommended for cockatiels, conures, love bird, quakers and similarly sized birds. 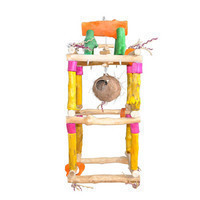 This all wood swinging play gym is approximately 7" tall and 8" square, with perch diameters of 3/8" and 1/2". Comes complete with wood chew toys and natural wood caps. Can also be set onto a table. Easily transported, too! Please click the picture for additional views. Made of java wood and colored with non-toxic, bird-safe coloring, these four-sided java play stands provide hours of fun for your bird. Hang it from the ceiling or in a cage. Recommended for smaller birds, from conures to pionus and birds similarly sized. 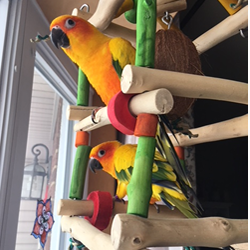 Made of java wood and colored with non-toxic, bird-safe coloring, these four-sided java play stands provide hours of fun for your bird. Hang it from the ceiling or in a cage. Recommended for medium birds. Made of java wood and colored with non-toxic, bird-safe coloring, these four-sided java play stands provide hours of fun for your bird. Hang it from the ceiling or in a cage. Recommended for medium to large birds.